I still haven’t started my shopping list (eeep!) but I am constantly on the look out for presents, hoping to see something that will inspire me, for the light bulb moment (ding! ), for just the right gift for the right person at the right price. Not easy, I tell ya. 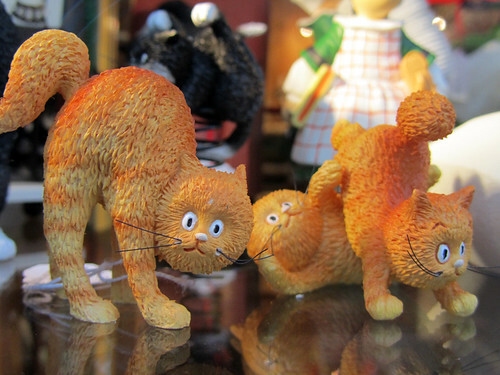 It was tempting to get these cute little kitties, except they’re on the pricey side. Apparently even ornamental items don’t come cheap in the festive season (or any other season when you are in Paris). The price tag I spotted marked €18, but I didn’t exactly investigate further if that’s the price for a single cat or the set of three. Worth buying? mines all done woohoo…spring cleaned and x’mas ‘tree’ is up too!